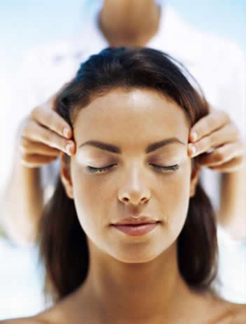 Indian Head massage is a therapeutic treatment originating in India thousands of years ago. Traditionally the treatment focused on the head and hair, to improve the condition of the scalp. As time has advanced Indian Head massage has expanded, incorporating the upper back, neck, shoulders, arms, head and face into the treatment. Indian head massage is a deep style of massage, deriving from Ayurvedic traditions using a variety of massage techniques to release negative blockages of energy within the body by applying pressure to certain points which in turn releases tension and increases circulation/energy levels. Indian Head massage has many physiological and psychological benefits for those who are stressed, suffering from anxiety or just looking for general relaxation. Indian Head massage is deeply relaxing and calming and can leave the client feeling energised, revitalised and more focused. Before the treatment the therapist will carry out a consultation with you to ensure that Indian Head massage is a suitable treatment and to tailor the treatment to your needs. The treatment can be seated or on the massage bed. During this treatment you will have the option to remove the upper body clothing (in private) and use a wrap around towel for the purpose of applying massage oil or you can choose to have the treatment without oils and just through your clothes. This makes it a great option for a treatment in your lunch break if you don’t want to go back to work with oil on your skin. If you would like an Indian Head Massage you can quickly book online, or give us a call on 0131 241 1833.